If you don’t want your home invaded this summer, you’ll want to learn the results of a summer-long experiment meant to test whether different light bulbs attract different amounts of bugs. It turns out that incandescent bulbs attract the most insects, while yellow-orange LEDs attract the least. Every night for an entire summer, Mike and Teresa Justice, two behavioral ecologists with PhDs from the University of North Carolina, Greensboro, set up a bug trap and turned on a single bulb inside. The type of bulb changed from night to night. They were careful to make sure that no bulb got more than its share of moonlight, which was relatively easy to plan—the moon being predictable. In the morning, they switched off the bulb and looked in the trap to see what it had caught. Over the summer, 8887 bugs fell prey to the light, but some lights pulled in more than their share. Incandescent bulbs had the highest capture rate, followed by CFL, halogen, LED with a cool color temperature, and a standard ‘bug’ light. At the bottom with the lowest capture rate were warm-colored LEDs. This was fitting, as Justice said that LEDs coming on the market were what inspired them to test the bug-attracting properties of different lights in the first place. 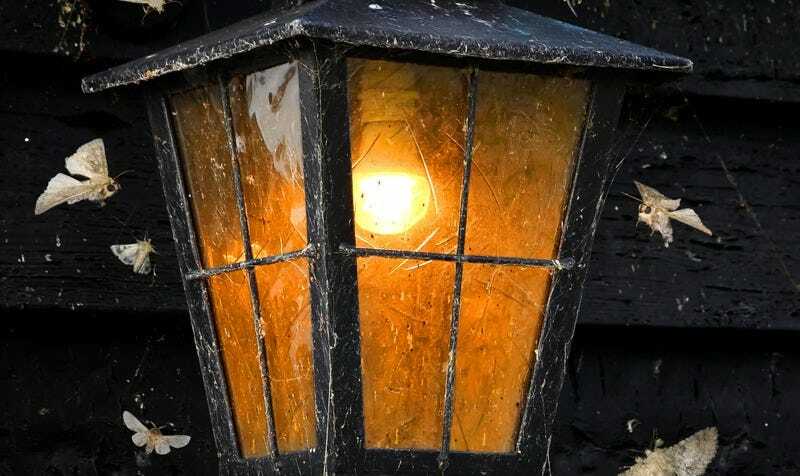 So, if you have a choice, choose a warm yellow-orange LED bulb to light your evenings on the porch.